The region witnessed an increase in the wasteland area since 1971, according to experts. Upstream dams trap silt and do not let it flow into the delta. Water-intensive agriculture and industrial practices are adding to the problem. The farmers of the delta, who had been working for the past few years to get their voice heard by national leaders, are taking the issues into the national election discussions. Despite being one of the oldest water-regulator structures in the world that is still functional, the Kallanai dam or the Grand Anicut looks almost empty with not much water to regulate. Located near Tiruchirapalli in Tamil Nadu, it was built across river Kaveri around 2000 years ago by then king Karikala Chola to divert water to the delta region to boost irrigation and also to avoid loss of crops to floods. Along with the imminent death of the river, Vimalnathan is pointing out another worrying factor that is threatening the very existence of this traditional ‘granary’ of Tamil Nadu. According to him, the delta region is shrinking fast with cultivable lands increasingly deteriorating into wastelands. To substantiate his claim, Vimal Nathan quoted findings of a study by S. Janakarajan, a retired faculty member with the Madras Institute of Development Studies (MIDS). “It’s no more a dynamic life-giving system that created and promoted civilisations. The Kaveri Water Disputes Tribunal and the governments in Tamil Nadu and Karnataka are considering the river as a mere water channel. The water wars between Karnataka and Tamil Nadu would end sooner or later as the river dries,” said Kaveri S. Dhanapalan, president of Nagappattinam-based Kaveri Delta Farmers Association. Sand being mined from the Kaveri bed. Photo by P. Jeganathan / Wikimedia Commons. “The delta districts contribute a substantial portion of Tamil Nadu’s foodgrain requirement and any threat to the cropping pattern would destabilise the food security. On another level, the grim situation has started affecting the livelihood resources of the thousands of farmers and farm workers,” said farmers’ leader Mannargudi S. Ranganathan, who exhorts for movement to save the delta. 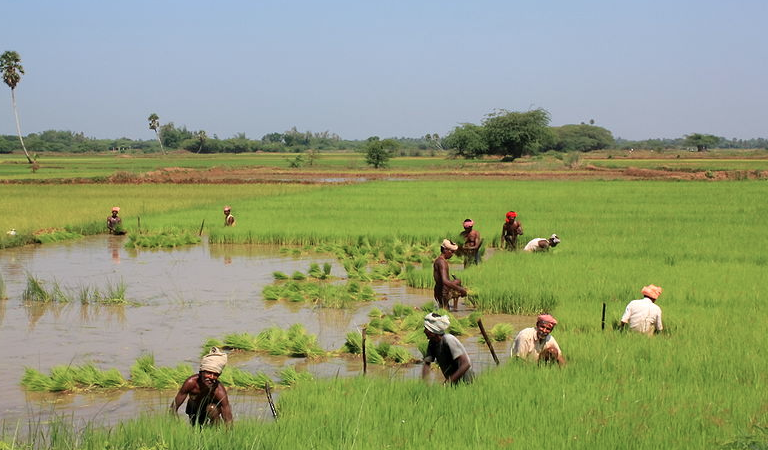 Rice cultivation in the Kaveri delta. Photo by Ricardo Martins / Wikimedia Commons. 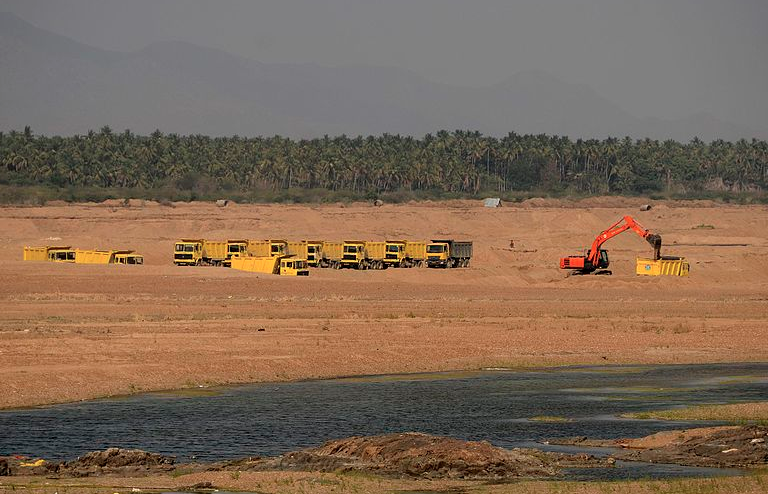 While the delta is facing decrease in sediment deposit, the Mettur dam is facing water storage problems due to siltation. Built in 1934, the dam used to have a storage capacity of 2708.8 million cubic metres (MCM). By 2004, this was reduced to 1994.2 MCM. Besides, data reveal that its capacity had reduced further to 1,889 MCM in 2015. Sediment flow to the Kaveri delta has been practically nil of late, as per a 2015 report by the Central Water Commission. 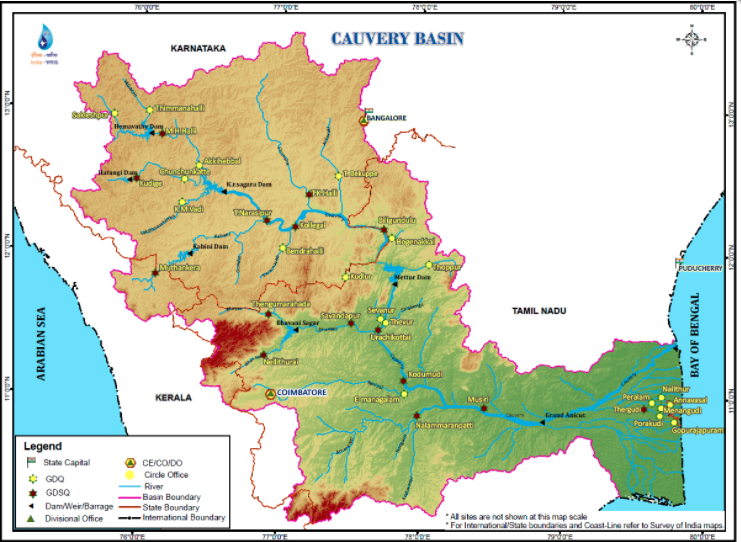 Map of the Kaveri basin. Credit: Water Resources Information System of India. Banner image: The view of river Kaveri near Trichy. Photo by K.A. Shaji.